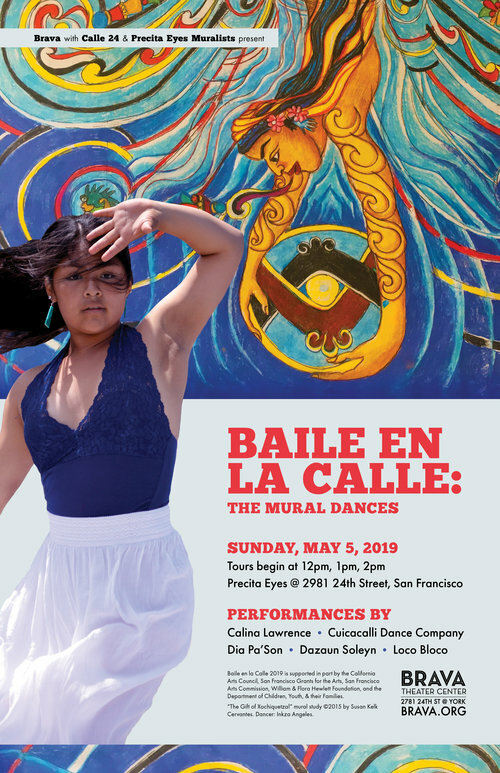 ​the 7th Annual "Baile en la Calle: The Mural Dances"
Brava! for Women in the Arts’ annual event takes over the streets and alleys of San Francisco’s Mission district to celebrate and preserve its living cultural heritage. ​Eight years in the vision, five in the making: Laguna Honda Hospital 600 foot mural dedication yesterday with District Supervision Norman Yee, whose constituents voted to help fund the project, muralists Yuka Ozoe and Elaine Chu, Precita Eyes founder Susan Cervantes, new board Kiry Luc and neighborhood naturalist Greg Gaar. Details from the newly-finished 600 foot mural at the base of Laguna Honda Hospital, started in 2015 by Precita Eyes muralists Elaine Chu and Yuka Ezoe, with the help of dozens of community partners. BECOME A MEMBER OF PRECITA EYES! Our members are essential to the work we do beautifying the environment, empowering communities, and preserving cultural legacies. • Individual ($60): Get a 10% discount on classes and workshops, and a 15% discount on store merchandise. • Family ($100): Get a 20% discount on classes and workshops, and a 15% discount on store purchases. • Contributor ($150): Get a 25% discount on classes and workshops, a 20% discount on store merchandise, plus two free mural tour tickets. Support us and enjoy member benefits and discounts.